The Downy Woodpecker is a somewhat small woodpecker, close to 6 inches. It looks like a smaller version of the Hairy Woodpecker with a shorter beak. Males have a small red patch on the back of the head, females don't. In my experience Downy Woodpeckers are bold little birds with almost no fear of humans. I've had them land in trees just beside me at eye level, close enough I could have reached out and touched them. Far too close for my lens to have focused on. They are busy little birds, feeding on insects in the stems of cattails or trees. 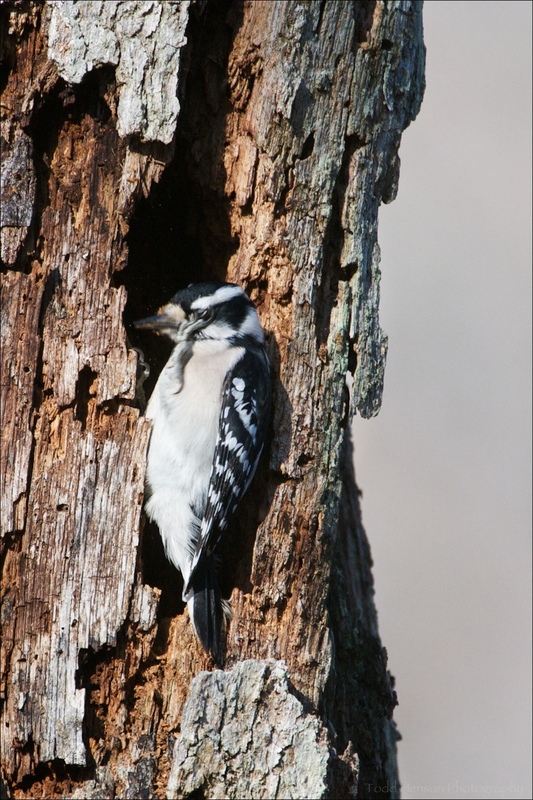 These photos show a Downy Woodpecker cleaning out a hollow in a tree. I spent a lot of time watching this particular bird. Notice in several of the photos the debris thrown from the hollow. She may have gotten something in the eye, as here you can see her scratching around the eye. Notice her tongue. It's easy to see how that tongue is useful in pulling out insects from the holes they create in trees, cattails, etc. Male Downy Woodpecker, beak fully into crack in small tree, feeding on insects. Notice he closes his eyes when pecking into the tree. Male Downy Woodpecker, having found another cracked branch, is pecking for insects. Again, notice the closed eyes.